ECHINODERMATA : SPINULOSIDA : Echinasteridae STARFISH, SEA URCHINS, ETC. Description: A stiff rigid starfish with a sandpapery texture to the dorsal surface. This species comes in a variety of colour forms, purple being the most common. It is only distinguished from the next species by the very fine dorsal spinelets which have 3-6 glassy points. Usually about 12cm across. 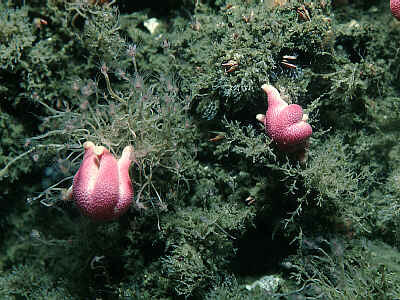 Habitat: Occurs in a variety of moderately exposed and exposed habitats on rocks and amongst hydroids, sponges, etc. Distribution: A northern species in the British Isles probably occurring with Henricia oculata on the west coast of Scotland. Similar Species: It may be impossible to distinguish this species from Henricia oculata except in the laboratory. Dorsal spines with 3-6 sharp glassy points. Picton, B.E. & Morrow, C.C. (2016). Henricia sanguinolenta (O F Müller, 1776). [In] Encyclopedia of Marine Life of Britain and Ireland.